EWG scientists reviewed Eb5 Facial Cream (old formulation) for safety according to the methodology outlined in our Skin Deep Cosmetics Database. We assess the ingredients listed on the labels of personal care products based on data in toxicity and regulatory databases, government and health agency assessments and the open scientific literature. 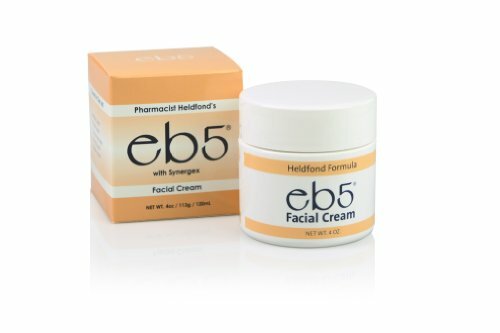 EWG's rating for Eb5 Facial Cream (old formulation) is 6. Deionized Water, Propylene Glycol, Tocopheryl Acetate, Stearic Acid, Mineral Oil, Cetyl Alcohol, Avena Sativa (Oat) Kernel Flour, Panthenol, Allantoin, Retinyl Palmitate, Cholecalciferol, Carbomer, Triethanolamine, Imidazolidinyl Urea, Potassium Sorbate, Methylparaben, Propylparaben. After cleansing and toning your face and throat properly, apply small amount with fingertips to various areas of face and throat. Using both hands with an outward and somewhat upward pressure, work eb5 into the skin in a sculpting manner. Continue until fully absorbed. Use morning and night.